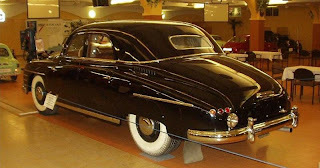 The Škoda VOS is a large sedan/saloon car produced by the by Czechoslovakian automaker AZNP at their plant in Mladá Boleslav between 1950 and 1952. For a few years it was the preferred car for senior political and military personnel in Czechoslovakia. It was never sold to the general public. In 1949 the plant at Mladá Boleslav assembled the last Škoda Superbs, large six-cylinder limousines evoking the style of American cars in the late 1930s. The authorities needed a more modern replacement and instructed Škoda to develop one. This was the car that would become the Škoda VOS. The letters VOS indicated a “special car for the government” in Czech or Slovak („Vládní Osobní Speciál"or „Vládny Osobný Špeciál“). The car went into production in 1950 with the coach builder (even then better known as a producer of buses) Karosa: final assembly took place at Škoda’s own plant. The form of the car was unremarkable, despite having been designed by Oldrich Meduna whose reputation till that point came from his work designing military tanks. The mechanical architecture was also conventional, with a front-mounted engine driving the rear wheels. More remarkable, at least in terms of European cars of the time, was a large 5.2-litre engine delivering 120 hp. The engine came from a Praga truck. Because of the weight of the armour plating, the standard car weighed nearly 4 tons, however. The top speed was restricted to 80 km/h (50 mph) on the orders of the interior ministry. A “Light-weight” version without all the armour plating was also listed. Unusually for the time, the car was fitted with air-conditioning. However, the air conditioning mechanism occupied most of the space in the boot/trunk, and it became common for dignitaries moving by VOS to travel followed by a second car to carry luggage. Famous owners included President Gottwald, Zhu De and Mao Zedong. Production of the VOS ended in 1952, by when 107 had been built. 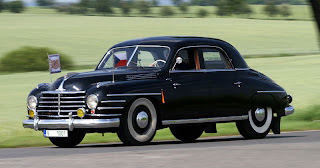 Škoda were not invited to replace the car, and the nation’s political elite switched their allegiance to the Tatra 603. Last updated on 1 March 2013 at 03:02.